For people without sales training, what is the disconnect between what sales is and their perception of it? 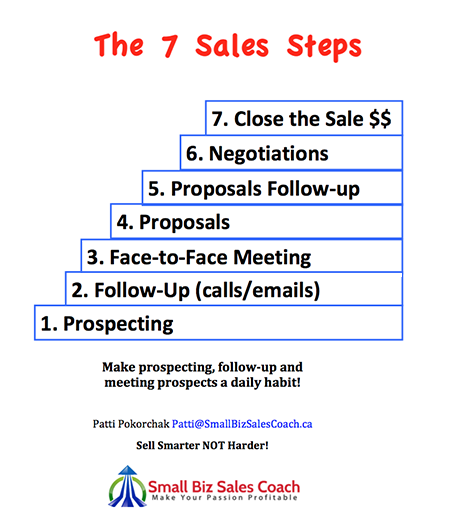 Patti: Entrepreneurs usually don’t want to be sales people or learn about sales. But the thing is, without sales, there is no business. So the biggest disconnect is that sales is a skills and profession that often isn’t taught. Part of my mission in life is to raise the profile of making sales respectable. The true purpose of advertising is to inform. With sales, it’s to be of service to others. The purpose of sales is not to manipulate or pressure people into doing something they don’t want to do. Selling – especially B2B selling– requires people with business sense and exceptional emotional intelligence. Why is emotional intelligence so important in sales? Patti: You need to read body language and be able to adapt to the person you’re dealing with. You can’t sell to everyone the same way. For example, selling to a Type A person that just wants the quick facts is very different than selling to a Type B that likes to chat. It’s still the same steps, but you have to make iterations for the follow up and proposal. You have to fine-tune depending on the person and type of sale and the complexity. The complexity of the sale increases the time. It could take you 6-12 months to even get to a proposal stage for a complex sale. The timeline often has to do with the price of the service or product you’re selling. You have to figure out the lifetime value of a customer. How complex is it? How big of a decision is it? When you’re selling B2B and small business you usually have to do that in 2-3 calls or else you’re going to lose money. What’s important for entrepreneurs and businesses to understand about closing deals? Patti: Selling is about being a matchmaker. It’s figuring out what problems they have, their goals, and aligning your services to help them reach those. You have to use emotional language and appeal to their needs and the most important thing is you have to show value. If people see the value, they will find the money. If people are coming to you and saying they don’t have time or budget, what that really means is you didn’t show them the value. It’s all about figuring out what makes you different. Why does Tony Robbins sell a conference pass for $10,000 and another coach sells for a different price? You never want to disparage your competition because that never looks good, but you have to show value in why you’re charging more. How do you show value? I explained that the course goes through a rigorous, time tested peer review before it goes out to the public, whereas the competition’s course was a one-off, never before run course. This is how you tilt that scale so you’re showing how you offer more value. On the value scale, these things mentioned caused the competition to go down in that buyer’s mind, while my value went up. You do that by showing proof – as in indisputable facts, preferably from an objective third party. It’s then a question of how much their team’s time is worth. Is it worth risking it spent on a course led by an entry level instructor, or on a proven one with a 100% guarantee? It’s then their choice to risk it on the cheaper course or go with someone proven that is worth 10 times more. You pay more for being proven and 100% guaranteed. At the end, the competition looks like a lemon and you look like an exotic papaya – which of course is more expensive. You have to pull out all the facts that you can. We have what we call “social proof” now. Where are your recommendations? Where are your testimonials? Where’s your social proof? By leveraging these things, you can show more value and convert more leads without having to be pushy. How do you build up that proof and trust? Patti: You have to focus on the results and the value that you achieve for customers. When I coach entrepreneurs on their sales skills, I use what I call a ‘Brag Sheet’. This Brag Sheet is not about what I can do, it’s about my clients and the results that they’ve achieved with my help. For example, helping a client get $20,000 more on one contract. That’s a concrete result achieved by my client. It’s proof that my knowledge transfers to my clients. It’s not about listening to me and what I sell, it’s about listening to clients and what they’ve achieved. I don’t try to sell my lifestyle or accomplishments. Nobody cares about how much money you make– it’s about them. Don’t sell to people, help people buy from you. How do you get better at this? Patti: Selling is actually listening, it’s not talking. You shouldn’t be talking more than a third of the time max. To close more business, ask better questions. Patti: Ask qualifying questions. The questions are very specific to what you are selling or the benefits you offer in order to uncover the need or want for your product or service. You need to find out if they have the pain points you solve or are looking for the pleasure you offer. People buy for pain or pleasure. You have to figure out what’s important to them. What’s their biggest challenge? Then figure out how you can help them. For example, selling a retreat is a nice-to-have. What I might really need is a weekend getaway so you’ll never sell me on the retreat. But drop the pennies in the bank and I might have the budget for it next year. People buy on their timeline, not yours. You also have to figure out what your average lifecycle is. If you haven’t had sales training, entrepreneurs usually do the “spray and pray” method. Attending a networking event and just handing out 100 cards is a waste of time if you haven’t qualified those leads. There’s a process and discipline to selling. These questions help pin point their needs so I can help them solve that problem. What are the steps in the sales process and which ones do people usually miss? Prospecting is knowing who your ideal target market is. You should have a couple of pre-qualifying questions to see if there’s a need, an interest, and/or a want. If you know you’ve helped a certain person with a certain job title, it’s never a cold call. The follow up is where most entrepreneurs fall down. When you go to a networking event or somewhere that you meet prospects, always follow up. I suggest both a follow up email and call or leave a voicemail. Ask when you can setup a Skype call or a coffee for a face-t0-face chat. Then you see if there’s a real need and priority. If there’s not a real need right now then you need a CRM, like Daylite for example, to keep track of that. You want to know at the end of that call if they’re open to you giving them a call in another 6 months, you need a system to remind you and make sure you call that person and have a place to keep your notes to remind you what you spoke about and their personal details and interests so you further your relationship with them. Proposals is where most leads want to talk about it and then see it in writing. Any B2B selling typically impacts a few people so they want to think about it. Then the negotiation happens. Always leave room for a possible discount of some sort as no one wants to pay list price, but everyone wants a special deal. Then finally, you have to ask for the order. At the end after you’ve negotiated, you still need to ask “Do you think I can help you?” and then shut up. What is the most common step missed by entrepreneurs? Patti: Asking for the order. When you have what I call the ‘bobble head’ nodding yes, at the end of the discussion you have to ask for the order. Sometimes the whole process from step 3 to 7 happens in one meeting or it can happen in 2 or 3 or even 10 meetings. To ask for the order, you explain that this is their issue as you understood it, here’s the solution, and ask them what they think. Then you need to zip your mouth and wait for them to answer. Being comfortable with silence is one of the hardest things for most entrepreneurs to get used to. The person knows they’re being asked to finish the deal and commit so you need to give them time to think about it and process it. Either they’ll say “yes” or “tell me more about…”. For example, they may want to know more about how the payment process works. And maybe it’s the payment plan holding them back so you could ask “Is this the only thing stopping from moving forward?’ And if that’s the case, then you can work with that and ask what kind of deal would work for them. When you ask the question, shut up and let them answer. There’s no tricks, it’s just techniques. And the technique is to ask “Do you want to work together?” and then let them answer. It could be a yes, it could be a maybe, or it could be a no. And getting a “no” is an objection you need to overcome. No doesn’t necessarily mean a hard no, it could mean “not right now”. And never take it personal. Often it’s just saying no to your offer at this time. How do you proceed when you get a no so you keep the opportunity open? Patti: It’s safe to say “Can I ask you why it isn’t appropriate for my own research?” Be curious. If you’ve established the need and it’s fairly high on their priority list, then ask why – what’s stopping them? Just out of curiosity. Maybe they have a big deal that they’re waiting to get payment from so they can’t budget it right now. That doesn’t mean they can’t afford you, it just means it’s a cashflow problem right now. You never want to assume. We often assume the worst. If I could offer one word of advice, it’s to turn into a three year old that’s always asking “why” out of curiosity. If you establish the need or want along with the value and it’s in their ballpark, ask for clarification so you know why. It’s part of what I call making prospects your BBF – your Best Business Friend. Treat them like they’re your business friend and you’re curious and you want to help them. You can’t help them until you know what they need and what they want. I always treat my clients as my equal. I learn from them and they learn from me. I don’t know everything about running a company and they don’t know much about sales because they’ve never been taught. That’s the biggest thing for me, it’s learning about the process and the discipline in sales and that’s where something like Daylite comes in. You’ve made all these connections with contacts – how are you keeping in touch? How are you staying top of mind with them and to follow up when you said you’d follow up? That is so key. You can call somebody 10 times a year overtime and then sometimes it’s on that 11th month when they call you and they now have the budget to move forward. You have to be persistent but in a helpful and fun way. You don’t have to tell them all the details, just give them a tease to get the conversation going. A lot of entrepreneurs aren’t that enthusiastic about what they’re selling and if you’re not enthusiastic, then they’re not going to be enthusiastic. What other advice can you give entrepreneurs and small business owners? Patti: Do it authentically and honestly. The only way to have a successful, sustainable business is to be open and honest with people. If you’re open and honest then they will be, too. It’s amazing what people will tell you if you just ask. Another tip about nailing the follow up, is that the key is to always add value if you can. Don’t send a boring follow up like “Hey, I’m following up on my quote. Did you get it?” What a waste of a message! Some of the best training for selling more is improv training. It teaches you to be present in the moment, listen actively, and to think fast on your feet. Every sales call you make is always different. You have to be creative to make each follow up more personal. How do you avoid making the follow up boring? The follow up is about being top of mind with them without being boring. Be authentic, show you care and that you’re interested. If you capture all the notes of what you talked about, you can use those to make it more creative and personal. Always make it about them and what you can do for them. It’s not about you. People don’t care about you until you’ve shown you care about them. How do you make it all about them? Patti: If somebody says, come and give me your pitch, I’ll first ask them a few questions and let them know its so I won’t bore them. Ask questions and say as little as you have to – that’s the key. The customers have a problem, they just want to know how you can solve it. If they’re only interesting in solving one problem, don’t pitch them on the other 10 things that you can do. Confused buyers won’t buy. If you overwhelm them with too much information, you’ll ruin the sale. People don’t want to work with someone who overwhelms them. They want to work with someone who’s relaxed and fun and understands them. “Have fun and make money” is what’s been on my business card for 20 years. If you’re not having fun, who cares about the money? People care more that you care about them and making sure they get a good deal. If you want a sustainable business, you have to be open, honest, caring, and give them fair value. 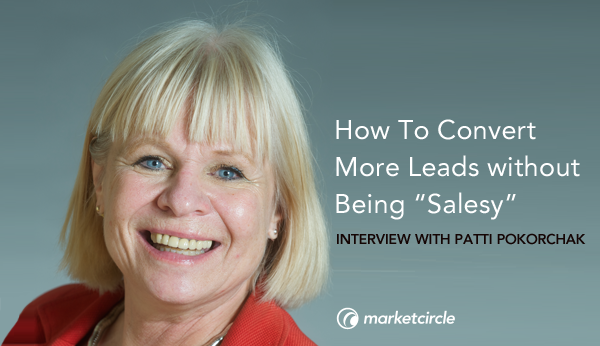 Want more great advice from Patti on how to convert more leads and growing your business faster? Visit her website smallbizsalescaoch.ca, connect with her on LinkedIn or follow her on Twitter. Order her book The Accidental Farmer: Adventures of a Serial Entrepreneur. If you’re in the Toronto area, you can attend her upcoming GET More Business Now Workshop.